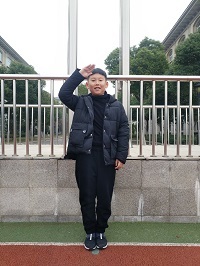 Dear teachers and classmates, hello!I am Nancy Wang from Class five Grade four. It is a great honor for me to be a flag raiser. Thank you for your trust and support. I am a lively, cheerful and lovely girl. In class, I speak actively and listen attentively. After class, I can finish my homework on time, and my academic performance is excellent. 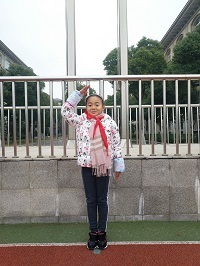 In WuXiHuishanJinqiao educational institution, I think it is a very happy and honored. thing.Today, facing the sun, we will slowly raise the bright five-star red flag. I will take this as a new starting point, raise the sail of self-confidence, constantly improve ourselves and make more progress every day. Hello everyone! My name is Zhao Yize. I’m ten years old. I’m a lovely and cheerful boy. 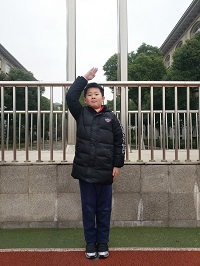 I come from class five grade four. I like playing batketball. My favourite colour is blue. Blue makes me feel alive. I like English and reading! And you ? In class, I’m a good helper of teachers . I have a lot of friends . Would you like to be my friend ? Hello, everybody. My name is Zhang Jinxuan. I’m ten years old. I’m from Class five Grade four. I like listening music. I’ve got lots of music, they’re very nice. I like reading too. Would you like to make friends with me?